Compatible with 68 to 73 mm bottom brackets as well as press-fit BB86, BB90, BB92 and BB95 and 100 mm fat bike frames! 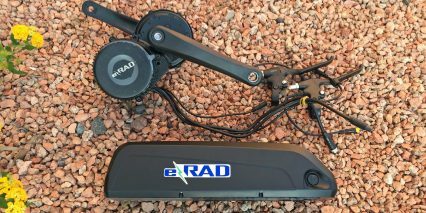 [UPDATE] I was told by Chris Head from e-RAD that they no longer sell the 500 watt mid-drive, they are focused on the 350, 750 and 1,000 watt models which I have reviewed here. 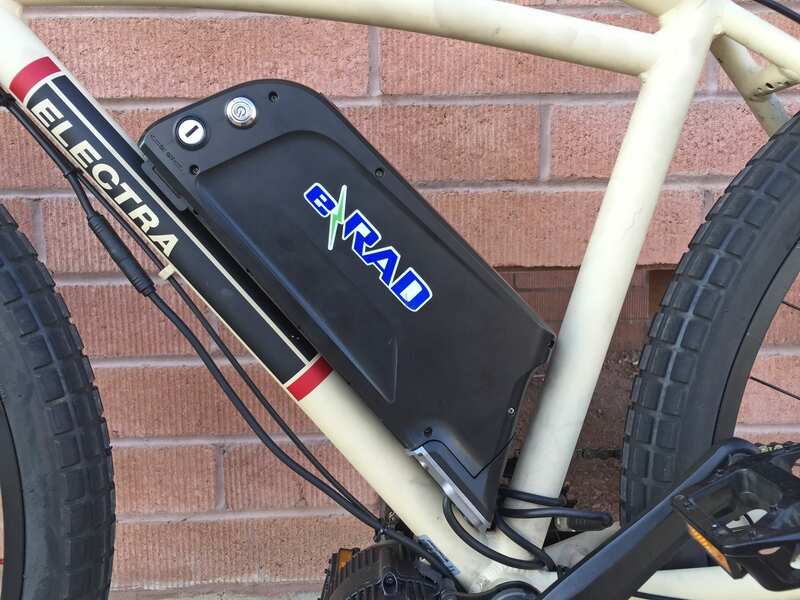 e-Rad is a line of kits and electric bike conversions created by Lectric Cycles out of Tempe Arizona. These mid-drive kits can be adapted to fit just about any bike frame (road, city, cargo or fat) which is pretty unique. What at first resembles the Bafang 8Fun BBS01 or BBS02 kits (only with a different logo) is actually something quite different… and much better in my opinion. These kits are based on forth generation designs of the BBS02 and are manufactured by Bafang but offer upgraded bearings for extended use, higher quality mosfet resistors for improved durability under heavy load, refined firmware and software for smoother and safer starts and an additional signal cable for use with a physical shift sensor. That means, these motors can sense when you shift gears and respond by dropping power momentarily to reduce mashing. The 500 watt kit is available in range of configurations including the stock adjustable 68 mm to 73 mm bottom bracket, four press-fit sizes (BB86, BB90, BB93 and BB95) that work with Trek and Giant frames as well as an extra wide 100 mm design for use with fat bikes. 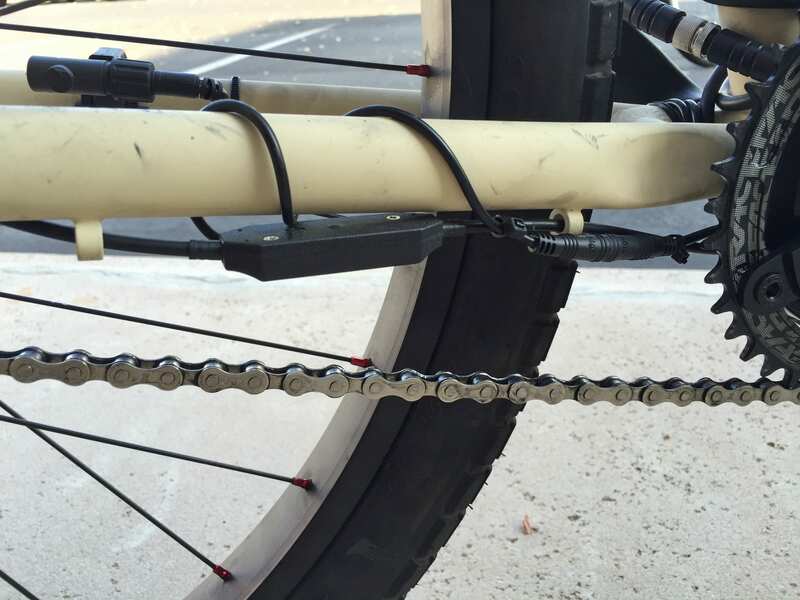 I’m a big proponent of mid-drive ebikes because they keep mass low and center on bicycle frames. 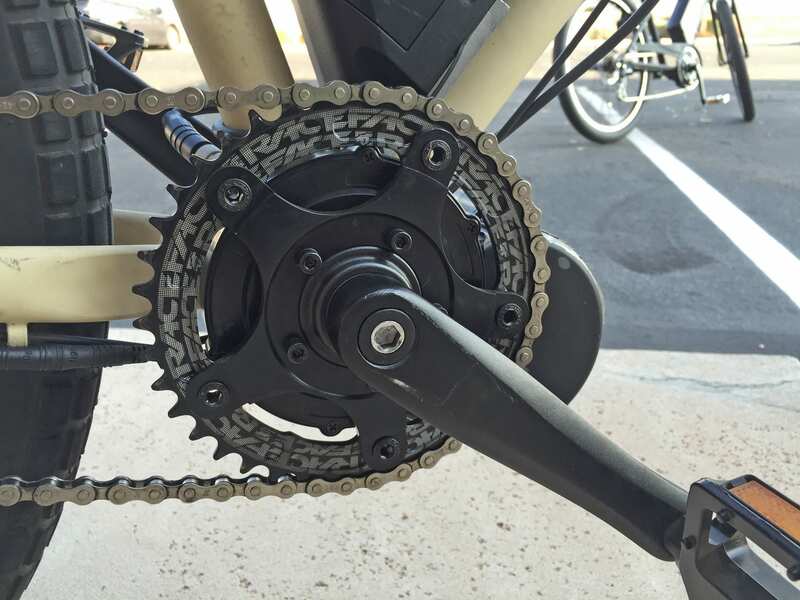 They reduce unsprung weight which improves rebound performance if your bike has a rear suspension swing arm and they improve climbing power and efficiency by leveraging a gear cluster or CVT like the NuVinci in the rear. The very similar “8Fun” design became popular in the US in 2013/2014 but many customers struggled to order direct from Bafang China and felt underwhelmed with the lack of support. There really wasn’t a warranty or representatives to work with if you needed parts. Some dealers bought these kits in small bulk orders to install, resell or use for repairs but often ran into liability issues. 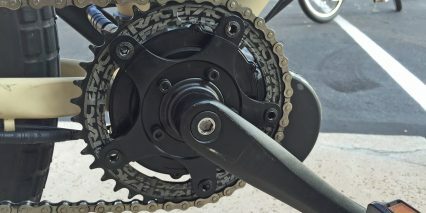 One huge limitation that everyone faced was the lack of sizing options and shift sensing customization… What Lectric Cycles has done with their custom designed e-RAD kits is deliver a superior design, with shift sensing and chainring options, and back it up with solid customer and dealer support (including manufacturer insurance). Now, whether you buy direct from them or through a shop you get a more complete and lasting product. 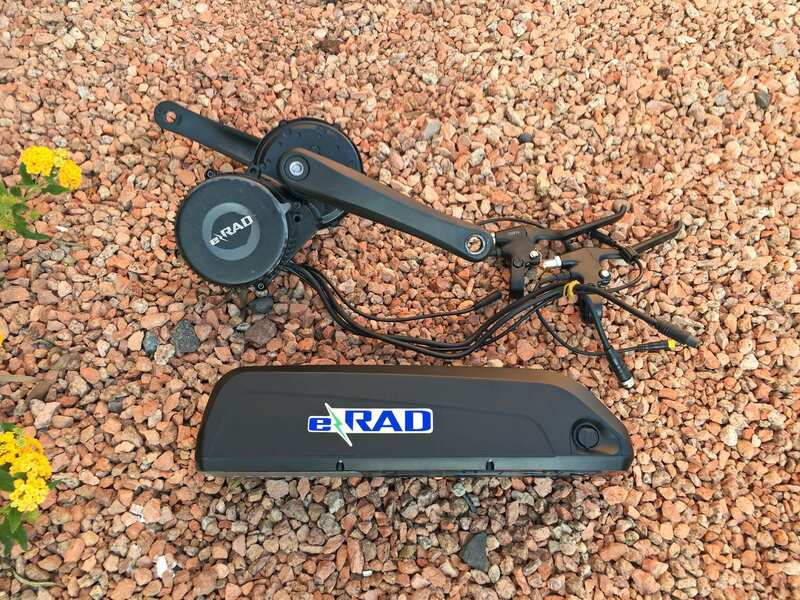 The eRAD kit is available in three sizes and the 500 watt version covered in this review strikes a balance between weight, power and price. 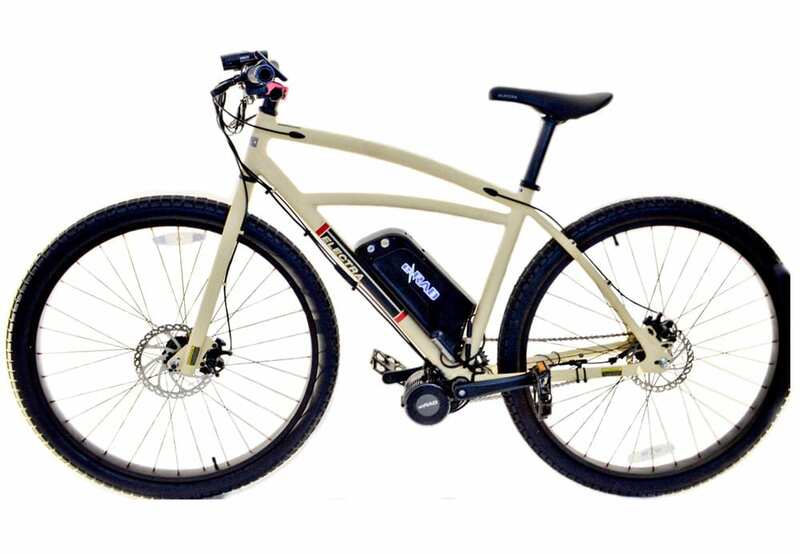 It’s their best selling model and often preferred for e-mountain bikes because it delivers 25 amps vs. the smaller 350 watt kit that only offers 18. 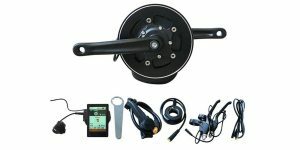 At the heart of this kit is a 500 watt geared e-RAD mid-drive motor unit. It mounts directly to the bottom bracket (that tube where your crank arms come out) and comes with two y-plates for strength, like torque arms for the motor… It’s black, relatively small and surprisingly quiet during operation. During my test rides I found that noise increased as I shifted to lower gears and had the motor spin faster. This is a slower spinning mid-drive than something like the Bosch system which uses smaller chainrings but it offers significantly more torque power. Built right into the motor casing is a controller that has been customized by Lectric Cycles for smooth starts. As mentioned earlier, the bearings inside have been upgraded along with the mosfets which are switches that control electromagnets for acceleration. When compared side by side with a standard 8Fun unit this motor might feel similar in terms of power but the benefits of upgraded hardware should result in longer lifespan and reduced potential for overloads which can kill the motor (if you try to start full throttle while using a high gear and overload the system). This is one of the only mid-drive systems I know of that even offers throttle mode and I love that it overrides pedal assist because that gives you a sense of control and maneuverability that’s perfect for the trail. I often ride in the lower levels assist level of assist and then pull the throttle for extra power when climbing short hills. For those who plan on using this kit for trails or steeper hills there are several chainring options available including the RaceFace NW with a smaller diameter, fewer teeth and better chain retention. The really amazing part of this motor system (if ordered in one of the larger custom widths or the BB press-fit cofigurations) is the combination of longer axles, threaded extenders and shims that Lectric Cycles designs and produces on-site in Arizona. This isn’t something that most people could do themselves and it extends the usefulness of the product in an amazing way. Powering the kit is your choice of a mid mounted or rack mounted Lithium-ion battery solution offering 36 volts of power. The big question is whether to go with the 11 amp hour standard pack or upgrade for $200 more and get the 14.5 amp hour pack. The more amp hours you get the further you’ll go but it also increases the weight by about half a pound. I’m writing this review at a time when the company is moving towards a new case which is lower profile and sleeker looking but the original “dolphin” case was also pretty nice. 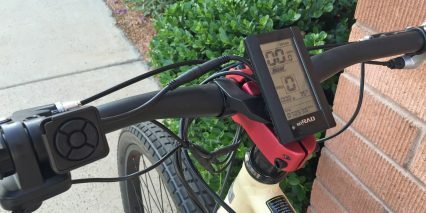 They both offer LED power level readouts so you can tell whether the pack is fully charged regardless of if it’s mounted to the frame or not. The packs are both locking and removable which is handy if you commute or need to reduce overall bike weight for transport on a car or bus rack. One big difference between the older and newer pack design is the lack of USB charging port on the new pack, it’s not a deal killer (I rarely use these power ports when riding) but it is a change. 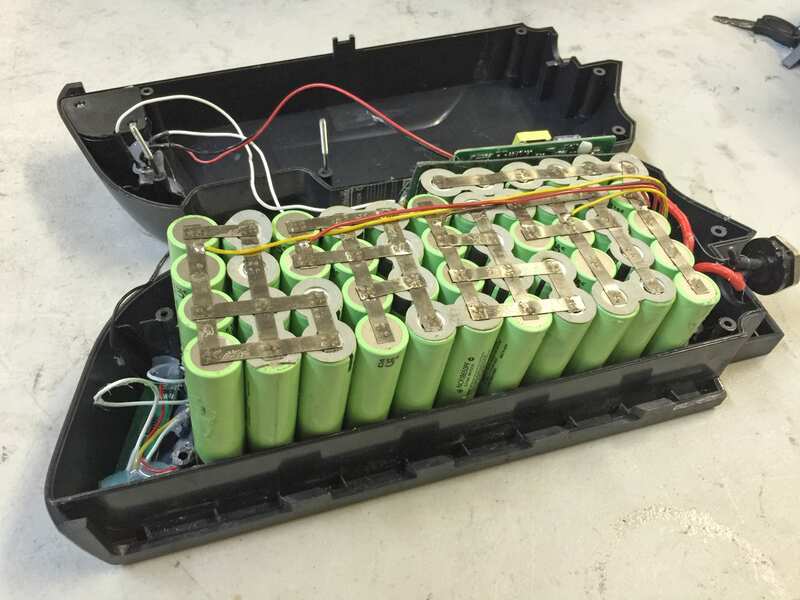 Inside the pack, Lectric Cycles uses the highest quality Panasonic cells which are known for being energy dense and very reliable (light and long lasting). I was able to peer inside while taking a tour of their shop and was impressed with the hard point welding used to connect each 18650 cell. Also, with the newer design there’s a plastic grid frame that holds each individual cell in place further reducing the potential for them to rattle loose on rough terrain. 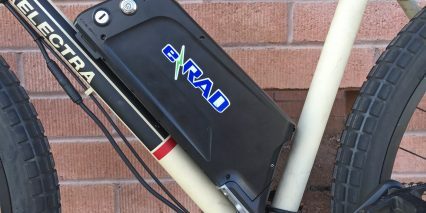 There’s a strong emphasis on quality with the e-RAD system and a thoughtful approach from guys who all love ride and want to deliver a product that will endure under rigorous use. 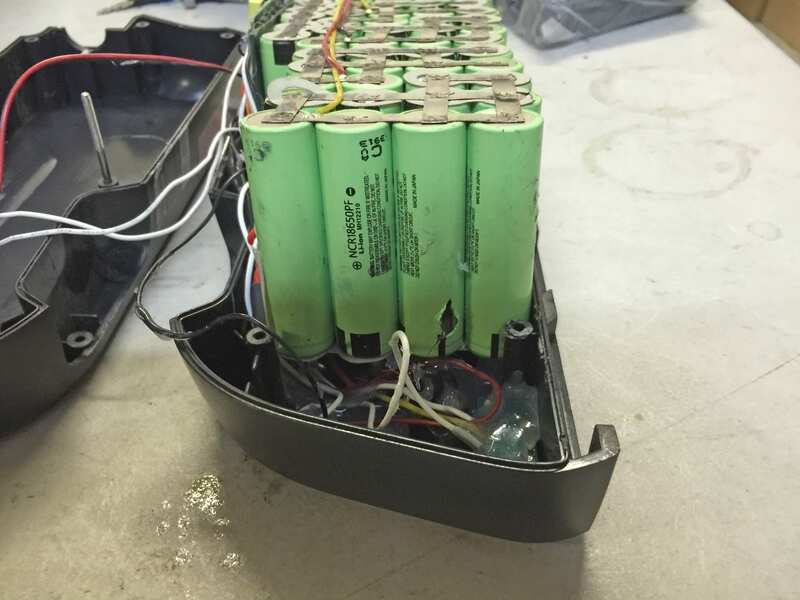 Keep in mind, to extend the life of your battery it’s best to store it in a cool dry place, extreme heat and cold can be hard on it. Also, try to keep it above 50% charged when storing for long periods so it doesn’t completely run dry and check in every couple of months for a quick top-off. 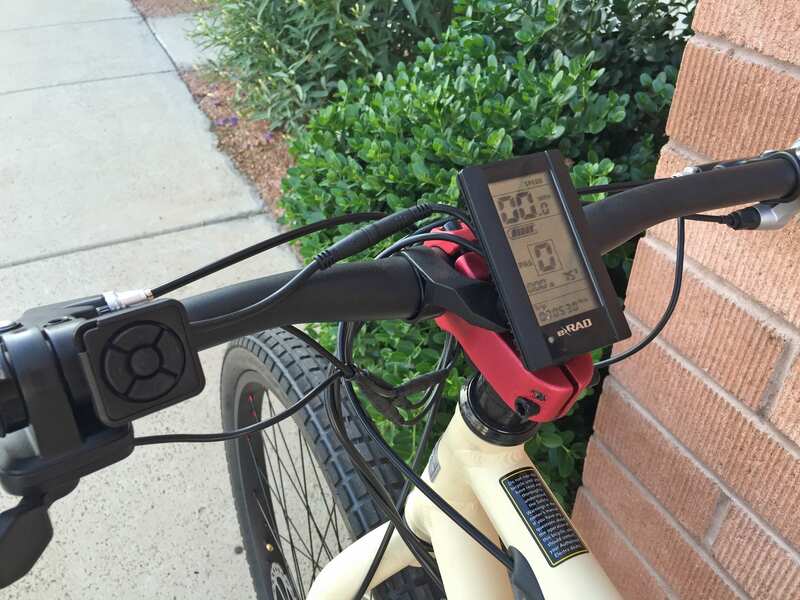 Operating this electric bike conversion kit is fairly standard and the display and control systems are very adaptable so they should work on a wide range of handlebars. First, you charge the battery pack up (either on or off the frame). From here, you’ll need to press the power button on the battery before you can actually turn the display on. Not all ebikes require this extra step and I’ve found that it can be easy to forget and leave on after a ride. Once the pack is on, you press the center circular button on the control pad and this powers up the LCD display. I like that the control pad is mounted separately from the display and can be fit snug next to your grips for easy access while riding. If you’re using this e-bike kit for a cruiser (with extra long bars) they offer an extender cable so the button pad will reach… just ask when ordering. 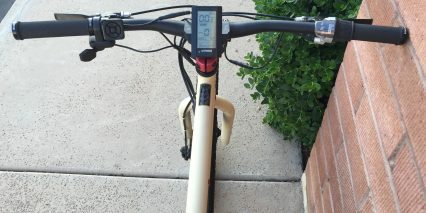 So, the LCD display mounts to the center of the handlebars and sits just above the stem. 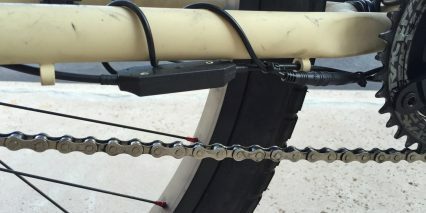 I saw it installed on cruisers, city bikes and mountain bikes without issue but did notice that it’s not designed to swivel or be removed which could be an issue in terms of glare, wear and tear or vandalism if you leave the bike outside a lot. Once on, you’re shown speed, battery level and assist level (default 1-5) which is controlled by pressing up and down on the pad. You can also press left on the pad to view average speed and max speed or right to view trip distance, odometer and time. This is all fairly standard but the really interesting bits are buried deeper in the system, by pressing the power circle two times rapidly in succession you enter into the advanced settings. By using the passcode provided by Lectric Cycles or your dealer you are able to adjust wheel size, top speed and other defaults. 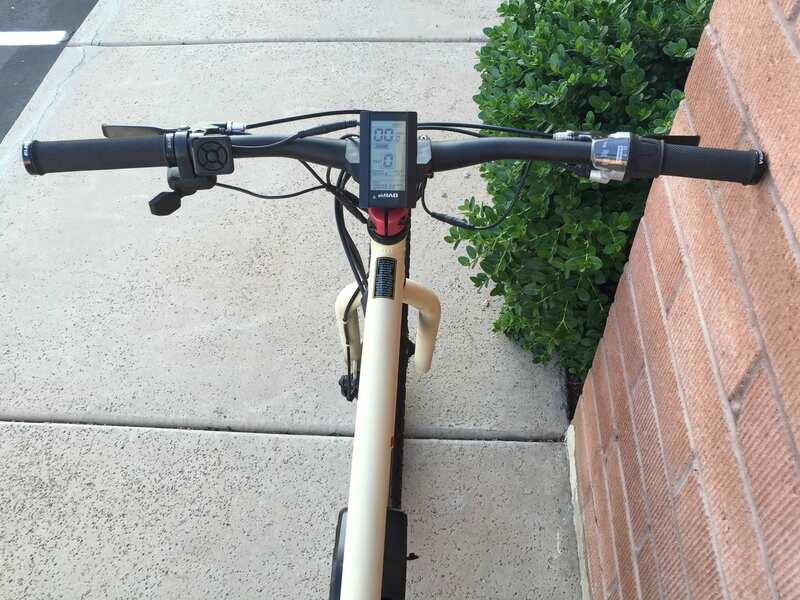 Depending on how you adjust the bike it’s possible to reach ~30 mph but this changes how the bike is viewed legally and may put you at risk of violating local laws if used improperly. Overall, the display and control pad are fairly standard but they enable you to do a lot with your bike because they are more open. It’s worth noting that the LCD has a built in light sensor for use at night. If you want to add a headlight and backlight you’ll probably need to get stand alone units like these rechargeable Cygolites (I’ve tested and like them) but that means they can be stolen easier, have to be charged separately and can add to the clutter of wires and displays already present. 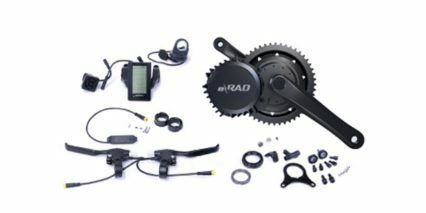 The e Rad mid-drive electric bike kits are some of the best I’ve reviewed to date and the 500 watt option is my personal favorite. The 350, 500 and 750 watt kits look similar but you can tell which one you’ve got by looking at the bottom of the unit (in case you’re buying this second hand). The more powerful options include more copper wiring inside to handle increased current and if you go all the way up to 750 watts the voltage switches to 48 vs. 36 which can hit nearly 40 mph when unlocked and haul extra large loads on cargo bikes etc. Whether you get this as a DIY, purchase through a shop who can help you install it or choose one of the pre-built Electra or Origin 8 models from e-RAD, you’re getting a nice drive system. There’s a lot of value being offered here in my opinion and they’ve clearly focused on building a better product over hyping their brand. I often hear forum users discussing the system components offered by Lectric Cycles, excited by the opportunity to convert a fat bike, use a continuously variable transmission like the NuVinci or upgrade a full suspension bike. 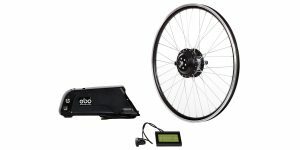 For those who already have a Bafang 8Fun kit, Lectric Cycles does sell many of their accessories and upgrades independently and this can be a great way to improve performance or fit. Given the warranty, solid customer support and dealer network being built by this company I feel like it’s a great way to go if you don’t mind the extra cable clutter and a bit of time and energy spent converting. If you’ve already got a bike you love and don’t mind getting your hands dirty (or paying a shop) this could be a great option. I enjoy your efforts. 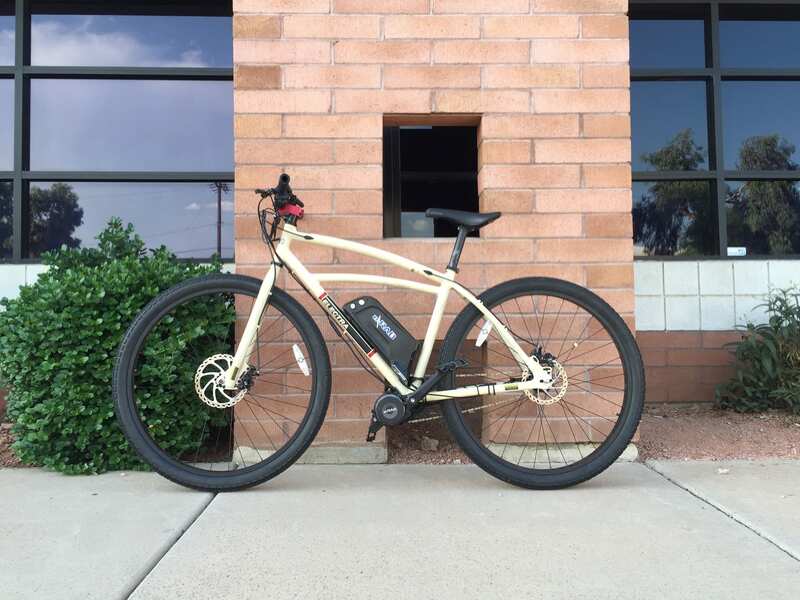 I’m 62 y/o 6’5″ 350lbs man willing to spend around $700 +/- for an ebike to do errands within 2 miles a few times a week and weekend exploration around my town and into the nearby hills. I want it to be as powerful and quiet as possible. Hi Geon! Some local shops might be able to help you with a custom build but there are others that only deal with unpowered bicycles and just wouldn’t have the experience or tools to do this for you. e-RAD has a bunch of dealers out there, it might be worth contacting one of them by first reaching out to e-RAD through their website. I do enjoy the efficiency and power of the 500 or 750 watt kit they sell, it’s priced well and can be adapted to almost any frame so you can choose a bicycle that fits your body type and ride style. I hope this helps to point you in the right direction. Alternatively, you could try to order a fully-built ebike online, something like the RadRover could be fun if you like the fat bike style. It fits the cost and loudness requirements and had good power but probably not quite as good as the e-RAD kits since they pull the chain and leverage your gears for extra power at different speeds. Hi Court, I really appreciate your knowledge in the field of electric bicycle and your readiness to help others, like me, who is just an amateur and beginner. I am planning to get an electric bicycle kit but have not yet made decision which one. So, I need your help. I am thinking of 8 fun Bafang mid-drive kit (Aliexpress) 500 w but I don’t know what is better – 36 or 48v. 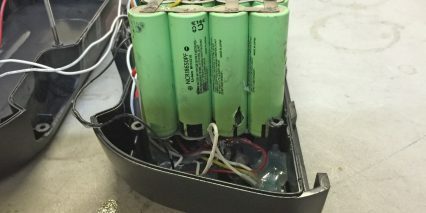 I am not sure which battery is the best for this motor. So could you be kind and give me some more information and your advice. 1. What is the difference between the motor 36V and 48V in terms of using this bike? 2.What is difference between battery 9 A, 11A ,15A or more – in terms of using? 3 Which motor and battery you recommend for the moderate use of bicycles through the city and its surroundings? 4. What is BBS 01,BBS 02 etc? 5. 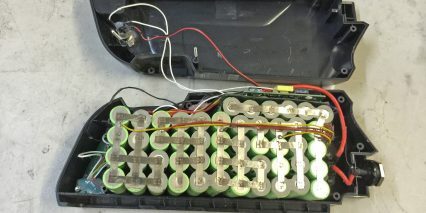 What form(shape) of battery is the most practical? Hi Jovo, great questions… I’ll try to help you out a bit. 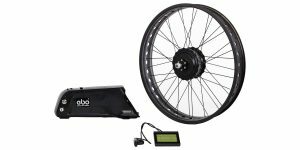 First off, the BBS02 is a solid electric bike kit with good power and both pedal assist and throttle mode. It does not include shift sensing unless you buy the e-RAD modified version which is offered in many power sizes including 500 watt. 1. 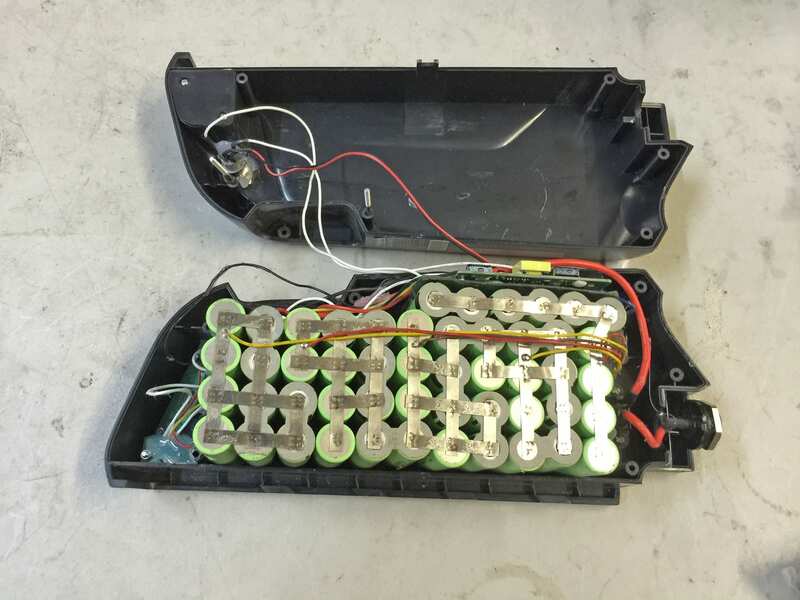 The 48 volt battery may offer more power than 36 volt, it will support the flow of more Amps (but that depends on the controller) and basically let your 500 watt motor perform better for climbing and accelerating. It will tend to discharge more quickly than a 36 volt pack because you will likely be accelerating and riding faster and experiencing more drag. If you want power for climbing and are a heavy person (or carry heavy loads) then get the 48 volt pack. If you are like me and only 135 lbs then the 36 might be cheaper and take you further as well as being lighter. 2. Amp hours are the measure of how much capacity a battery has… sort of. The true capacity is “Watt hours” which you calculate by multiplying Voltage by Amp hours (for example a 48 V 9 Ah pack = 432 Wh and a 36 V 15 Ah pack = 540 Ah which is “larger” but maybe not as powerful). 3. 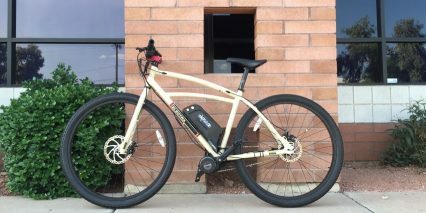 For a fit rider who is pedaling around town you can get a basic internally geared hub motor with 350 watts and a 36 Volt 10 Amp hour battery and be just fine for 15 to 20 miles on throttle alone, if you pedal along you can go much further. 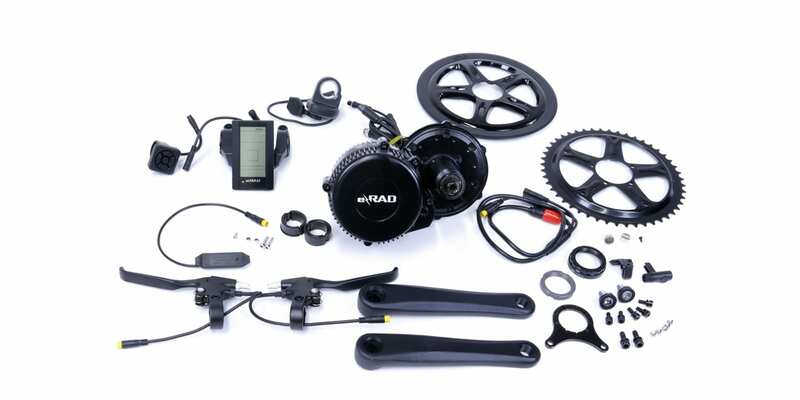 Now if you want a mid-drive kit like the e-RAD here you will get even greater range because it can benefit from using your gears. You don’t need to overdo it with a super powerful motor, the 500 watt kit would be very powerful for someone like me at ~135 lbs. 4. BBS01 and BBS02 are labels for the “Bottom Bracket System” 01 and 02 are the design spec so 01 is for 350 watt and 02 is for 500 and 750 watt. The 02 kits are heavier because they have more Copper winding inside to produce more power. 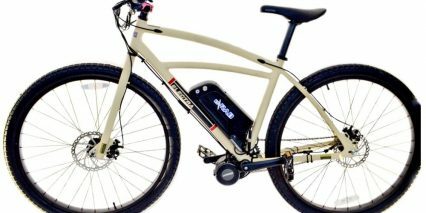 There is a new kit being manufactured by Bafang that offers 1,000 watts and is called the BBSHD. 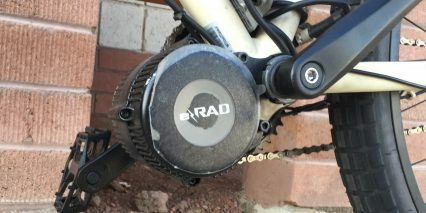 Note that Lectric Cycles and their company e-RAD have motors custom made by Bafang. Most of the other BBS01/BBS02 units you see are made by 8Fun and use a more basic design. They are all manufactured by Bafang but not all units have the same designs, components and control software. 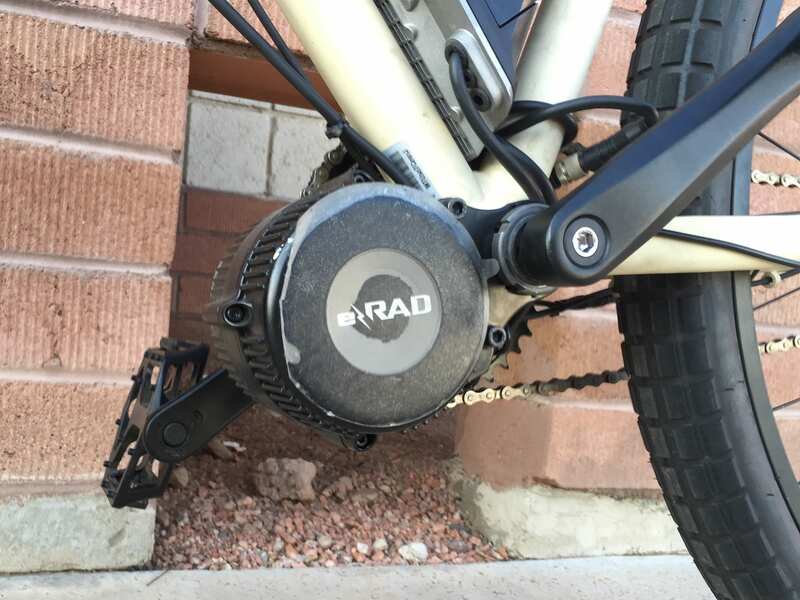 The e-RAD systems are some of the best because they are sold in many physical sizes (bottom bracket widths) and offer shift-sensing so they don’t break your chain and wear out your sprockets and derailleurs as quickly. 5. I prefer Lithium-ion cells because they are light weight and long lasting. These days you can get really nice cells from Samsung and Panasonic or more generic ones that might be heavier. 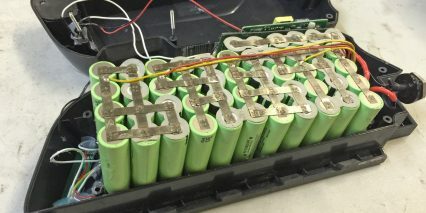 Just like cell phone batteries are getting smaller in size and weight and larger in power you can get nicer batteries for ebikes and this comes down to “energy density” how much energy can be packed into a smaller size. As far as shape, I prefer the downtube mounted packs so that I can use the rear portion of the bike for a rack or fenders. The mid-mounted packs tend to be lower for improved balance and they also stay out of the way and are protected by the frame if you crash (more so than a rear rack). Court, I know we are 6+ months beyond your posting of this review…but I have to say your two videos which have taught me the most are your ‘racing’ around Lectric Cycles’ shop, a bit like a kid at recess, doing a long ‘show & tell’ about eRAD choices & mods and your interview with your Uncle on actually using a mid-drive ebike for 4,000 miles over one full year. (Mid-drive bikes have their benefits…but they don’t come without their ‘costs’. Which is why eRAD’s shift sensor is sooo cool). For those reading this review, don’t miss the ‘Court wanders around Lectric Cycles shop’ (it’s mentioned above but the URL is https://www.youtube.com/watch?v=sBe_OLUBuCY&feature=youtu.be ) and Court’s interview with Greg after one year & 4,000 miles (https://www.youtube.com/watch?v=RuSKCSFuxdY). I am VERY impressed with what Lectric Cycles is doing down there in Tempe! Thanks again, Court. Hello Court, Thanks so much for the awesome reviews. I would be completely lost without them. I am deciding between the e-rad mid-drive 500 and the bionx d500. The e-rad’s mid-drive system works well with my riding style and still looks like a bike from the road, but I was wondering if there was a solution to all the cables the clutter the bike. The more I research the e-rad 500, the less I care about the bionx, the rear wheel motor really stands out, although I like the regenerative charge for down hill and breaking, I also like my free wheel, and not a fan of the hub motor on the bionx either. However it seems like the bionx has less cable mess to deal with. So, I guess I am seeking your opinion on aesthetics of wiring, I am converting a surly karate monkey, which is a beautiful bike, and I just don’t want to muck it too badly. Any suggestion on all those wires? Hey Michael, I feel you on the wire clutter… and the Karate Monkey is a great platform to build on! Installing a mid-drive can be a bit more complicated but I’m not convinced that it means more wires. I don’t have an obvious solution for hiding them either… but some engineering type modders have run them through the frame. One member of the e-RAD team in fact has done this for a living for competitive cyclists in the past on custom frames (normal pedal powered bikes mind you). I love the BionX system for being so quiet, smooth and advanced but I also love the balance of a mid-drive and appreciate the shift sensing with e-RAD. Call their shop and ask about the cables and how the kit would work on the Surly. It sounds like you’re leaning that direction and the company has been really responsive with me. BionX systems come pre-installed on lots of bikes like those from OHM but you can also work with shops to get and install kits. That direction might depend on whether there are supporting shops nearby. I am more than 90 kg (200 lbs) and I wonder whether bafang mid drive motor kit 500W would be enough powerful for me to go on the flats but up hills too? Do you recommend me 36 or 48V concerning my weight? What is more important to follow when driving to be sure that motor will have longevity? How long I can drive bicycle in throttle only mode (on the flats or up hills) to avoid overheating or any other damage? Hi Court, I have one more question. I have bought Bafang 750 Watt Mid Drive Conversion Kit but my bike has hydraulic brakes. How to put brake levers on my bicycle? Hi Jovo, I believe that if your frame supports disc brakes and you’re able to install them the motor should work fine… but may not be able to use the brake inhibitors. So you could just leave those disconnected and ride as safely as possible knowing that you didn’t have an override. One alternative approach would be to purchase ebike specific brake levers like those offered by Tektro so the motor inhibitors would still function as designed. Thanks Court! Is this the part I need to get my hydraulic brakes to work with the electric drive system for brake cutoff? Hmmm… That’s a great question (and it sounds like you have an awesome bike!) my only concern would be mounting the beltring (the chainring for the belt drive) to the mid-drive motor and making it work with the cranks. I’m not an expert at this but have seen some companies making a wide range of chainrings to adapt… just not beltrings. I’d ask Lectric Cycles and see what they think and also just look close at your drivetrain an see if there are holes there which could be used to mount to the e-Rad motor? I’d love to hear what you come up with. Feel free to share pictures and repost this question in the e-RAD forums here.